FILE - A Nicaraguan exile, who wishes to only be identified by her nickname "La Profe," Spanish for "the teacher," holds a sign asking for spare change in Alajuela, Costa Rica, March 29, 2019. 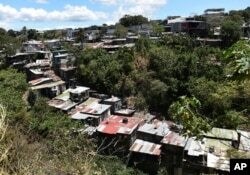 FILE - This March 29, 2019, photo shows a bird's eye view of La Carpio, a shantytown on the outskirts of San Jose, Costa Rica. The number of Nicaraguan exiles living in La Carpio has swelled since the Nicaraguan protests that began last April. Alliance director Azahalea Solis said the group rejected the proposal as "absurd." "It's ridiculous to act like the exiles would believe the same government that threatened them, persecuted them, killed their relatives and occupied their houses is now going to safeguard their lives and safety," Solis said. She said the proposal did not include any real mechanism for protecting those who return. 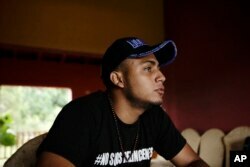 FILE - Jairo Bonilla, leader of the April 19 student movement, wears a T-shirt designed with a hashtag that reads in Spanish: "We are not criminals," during an interview in Managua, Nicaragua, July 28, 2018. Human rights activist Sara Henriquez, exiled in Italy, called the proposal a "tremendous joke."